At Sarasota Synagogue Tribute to Martin Luther King, Jr.
A rabbi who was once jailed with Dr. Martin Luther King Jr. gave the ultimate compliment to a black poetry reader after a tribute to King at Temple Emanu-El in Sarasota. 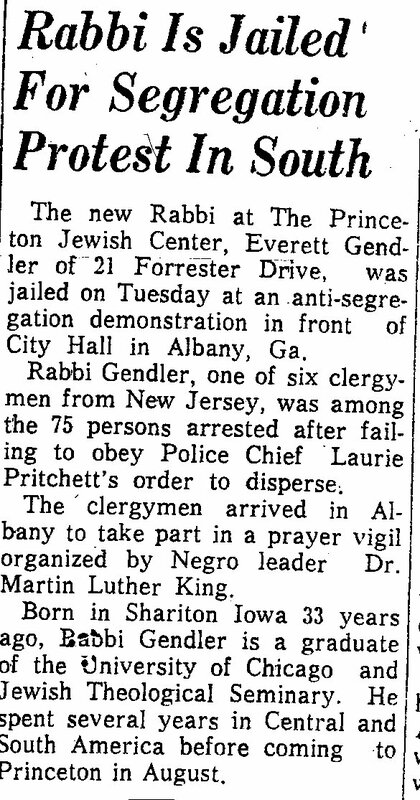 Eleven rabbis were jailed with King in Albany, Georgia, for “public prayer without a license” in 1962. Ok, so it’s a little presumptuous to claim Rabbi Everett Gendler as Chariton’s own, although like all true Lucas Countyans of certain ages (like me), he was born at Yocom Hospital — on August 8, 1928. And he lived here with his parents, Max and Sara Gendler, and sister, Annette, until he turned 11. Then the family moved to Des Moines. But I’m going to stake the claim anyway. This is the second of two posts about Rabbi Everett Gendler, born in Chariton during 1928, and his family, parents Max and Sara and sister, Annette, and others. The Max Gendler family lived in Chariton until 1939, when they moved to Des Moines. Their principal business was Gendler grocery, located on the southeast corner of the square in the building that now houses Chariton Floral. I am writing this essay on the fortieth anniversary of my father’s death, so my immediate thought about Martin Luther King, Jr. this morning is of those four precious small children left fatherless on April 4, 1968. On Friday June 20 at 7:30 PM Al Vorspan and Rabbi Everett Gendler will speak at Shabbat services about their participation in the Civil Rights movement in the 1950s and their commitment to “Tikkun Olam” (healing the world). On a ferociously cold evening in November 1978, Rabbi Everett Gendler climbed atop the icy roof of Temple Emanuel in Lowell, Mass., and installed solar panels to fuel the synagogue’s ner tamid (eternal light).